Skoda will be presenting the new SportLine trim, of the Karoq at the Paris Motor Show in October. The Karoq SportLine will be offered in the most powerful petrol from the range which will develop 190bhp. 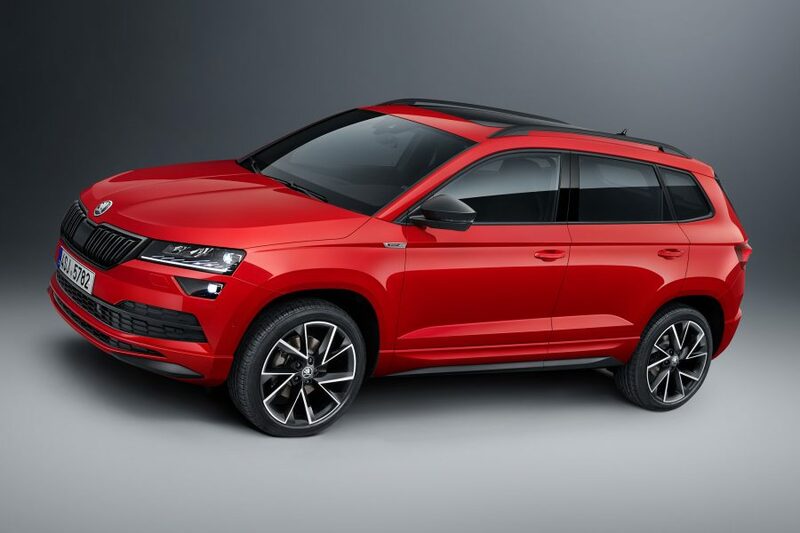 In terms of appearance, the Karoq SportLine gets sportier looking bumpers, 19-inch black wheels, front mudguards with SportLine logo and black roof rails. In the interior, black sports seats with contrasting silver stitch catch the eye. The seats are upholstered with the air-permeable Thermoflux fabric, which Skoda says brings extra comfort to passengers, especially in summer. The multifunction sports steering wheel is covered with perforated black leather with stitching in silver. Pedals with stainless steel elements, a black headliner, black roof pillars and an LED package, which includes ambient lighting, complete the sporty interior. There are four engine options to choose from. While the 2.0 TSI petrol engine with 190bhp is offered exclusively by Skoda for the Karoq SportLine. The more powerful of the two 2.0 TDI diesel engines also produce 190bhp. In combination with this drivetrain, the compact SUV brings power to the road with a 7-speed DSG and four-wheel drive. The front-wheel-drive 2.0 TDI with 150bhp comes with a manual 6-speed gearbox as standard. Four-wheel drive, combined with 7-speed DSG, is optionally available for this model. For the 1.5 TSI petrol engine with front-wheel drive, Skoda also offers the 7-speed DSG as an option, also in combination with all-wheel drive.